SCARLET RED PEARL, BLACK, PREMIUM CLOTH SEATING SURFACES, BLACK, LEATHER SEATING SURFACES, Window Grid Antenna, Wheels: 16" x 6.5J Steel w/Covers, Variable Intermittent Wipers, Urethane Gear Shift Knob, Trip Computer, Transmission: 6-Speed Automatic w/SHIFTRONIC -inc: Active ECO system, Torsion Beam Rear Suspension w/Coil Springs. 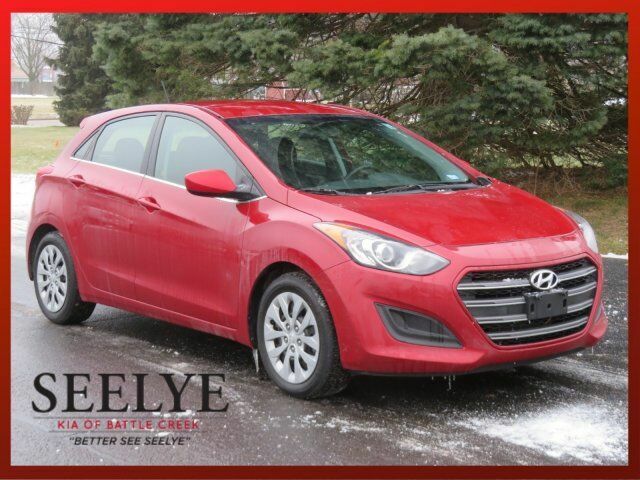 This Hyundai Elantra GT has a strong Regular Unleaded I-4 2.0 L/122 engine powering this Automatic transmission. Tires: P205/55R16, Tailgate/Rear Door Lock Included w/Power Door Locks, Strut Front Suspension w/Coil Springs, Steel Spare Wheel, Single Stainless Steel Exhaust, Side Impact Beams, Selective Service Internet Access, Rigid Cargo Cover, Remote Keyless Entry w/Illuminated Entry, Illuminated Ignition Switch and Panic Button, Refrigerated/Cooled Box Located In The Glovebox, Driver / Passenger And Rear Door Bins, Rear Cupholder, Rear Child Safety Locks, Radio: AM/FM/SiriusXM/CD/MP3 Audio System -inc: 6 speakers, Bluetooth hands-free phone system, iPod/USB and MP3 auxiliary input jacks, SiriusXM comes, Radio w/Seek-Scan, Clock, Speed Compensated Volume Control and Steering Wheel Controls, Projector Beam Halogen Daytime Running Headlamps w/Delay-Off, Premium Cloth Seating Surfaces, Power Rear Windows, Power Fuel Flap Locking Type, Power Door Locks w/Autolock Feature, Power 1st Row Windows w/Driver 1-Touch Down.